Both of the ECGs show sinus rhythm with normal QRS complex morphology. There is ST segment depression in leads III and aVF with inappropriate large "volume" T-wave inversion. This is reciprocal to a small amount of ST elevation in lead aVL, with suspiciously large amount of area underneath the ST segment and T-wave, suspicious for hyperacute T-waves. In the context of the inappropriate (inappropriate for the QRS) STE in aVL with reciprocal inferior STD, these T-wave must be considered truly diagnostic for hyperacute T-waves. In the first ECG, take a close look at the PVC that occurs in leads aVR, aVL, and aVF just before the precordial leads start. What do you notice? There is concordant ST elevation in that PVC in lead aVL. PVCs, like any other form of abnormal conduction (LBBB, ventricular paced rhythm, etc) generally follow the rule of appropriate discordance (which states that the ST segment and T wave will deviate away from the majority of the abnormally conducted QRS complex). So in the absence of superimposed ST elevation, the PVC in aVL should have an isoelectric or depressed ST segment following that large, abnormally conducted R wave. Instead, the J point is clearly above the baseline. This is concordant ST elevation, and we believe based on much experience with this exact question and many prior cases showing this, that this is also diagnostic of acute transmural ischemia just as it has been shown to be in LBBB (and soon, ventricular paced rhythm). So this ECG is diagnostic for the fact that the high lateral wall has very recently lost its blood supply. The ECG reports the acute transmural thickness of the myocardium at the cellular level, and the cells do not know or care why they have acutely lost blood supply - any etiology of acute coronary occlusion, or even small vessel ischemia such as is seen in takotsubo stress cardiomyopathy, or in "No Reflow" phenomenon after opening of an occluded coronary artery, will produce the same ECG changes. On a population level, by far the most common etiology for acute coronary occlusion is type 1 ACS (plaque rupture causing acute thrombotic occlusion). But remember, the ECG just shows the fact that there is an occlusion, not the etiology of the occlusion. The EKG had been sent to medical control approximately 15 minutes prior to my review, and my paramedic friend had been worried by it so he took it immediately to an ED physician for review. Although he mentioned that he was worried about aVL and the inferior reciprocal changes, the reviewing attending disagreed and did not think that it warranted prehospital cath lab activation. I was immediately worried about what might happen to the patient. I asked him which hospital the patient had been transported to (our medical control services oversees many different hospitals). Luckily, he responded that the patient had just arrived in our ED! So I went to find him and make sure that the receiving team had gotten copies of these prehospital ECGs. He was a 33 year old male with history of asthma and smoking who called EMS for sudden onset chest pressure beginning 1 hour prior to arrival. He stated he had just finished urinating when he was reaching to flush the toilet when he suddenly felt a cramping pain in his mid back. When he went immediately to lay down, the pain radiated into the center of his chest. He took tylenol with no improvement, then called EMS. EMS administered ASA, NTG, and 5mg morphine with improvement in pain. He adamantly denied any ingestions, drugs, cocaine, etc. The findings are much more subtle compared to the prehospital ECGs, but still present. There is also a tiny new Q wave compared to the priors. Because the findings have decreased, but the T-wave is still upright, it is hard to say whether the artery is still fully occluded or whether we might be witnessing the beginning of the changes of reperfusion. If the artery is reperfusing, we should soon see complete resolution and/or the classic reperfusion sequence of terminal T-wave inversion followed by full T-wave inversion over time. Overall, the treating team interpreted the clinical picture as improving, and did not immediately activate the cath lab but instead continued aggressive bedside evaluation and serial ECGs. There was no appreciable wall motion abnormality upon bedside echo without contrast. The iStat point of care troponin I returned at 0.38 ng/mL (elevated, normal less than 0.08 ng/mL). In general, iStat troponins can be unreliable, although the higher the result the more likely it is true. The initial troponin T returned at 0.04 ng/dL (also slightly elevated from normal which is less than 0.01 for this assay). At this point, only ~20 minutes after arrival, they activated the cath lab. The patient was taken immediately for cathetization, which showed "mid to distal 1st diagonal branch revealed 90% stenosis and mid-distal segment attenuated and appears in spasm, unresponsive to intracoronary NTG and intracoronary nicardipine." The RCA and LCX were normal. See the cath images below. In this view you see the LAD (largest vessel coming down the center of the screen), with the large 1st diagonal branching off and appearing robust until approximately halfway down its length, when it suddenly is extremely narrowed and then followed by downstream low attenuation. See next picture for annotation. The arrow points out the beginning of the spasm of the D1. The cath report states that he had improvement in symptoms and ECG findings despite the fact that the angiographic appearance was not improved after the intracoronary administration of NTG and nicardipine. Given this improvement and the suspected spasm as the etiology, they did not place a stent, but instead planned to treat the patient with medical therapy including amlodipine and NTG as needed. His serial troponin T rose from initial 0.04 to 0.43 to 0.66, then started to trend back downward. There appears to be no resolution of active injury on the ECG. Rather, it appears as though there is ongoing injury and progression along the classical pattern of OMI. 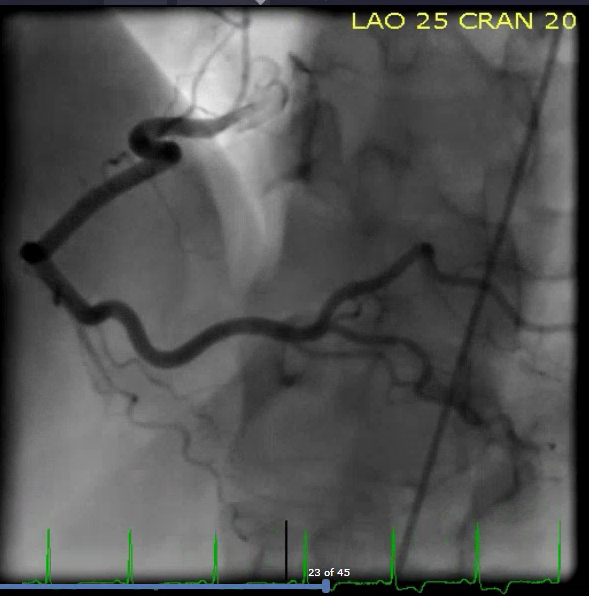 This is concerning for persistent downstream ischemia despite an open artery angiographically. Two more hours later. Now you can see the development of larger Q waves in lead aVL. There is persistent STE in aVL with reciprocal STD in III and aVF. No longer any R wave in aVL, replaced entirely by Q wave. This does not necessarily mean that the full thickness of the high lateral wall has infarcted, because stunned but viable myocardium may also produce a Q wave and later recover. The cardiologists plan on repeat catheterization in several weeks after medical therapy to reassess whether any other intervention will be necessary. Make sure you have a system in place so that your EMS ECGs get delivered to the receiving ED team every time, even when they are originally interpreted as normal. The ECG cannot tell you the etiology of OMI. By the numbers, the etiology must be assumed to be one treated by immediate reperfusion therapy (in the absence of a specific known alternate cause). This is not a "false positive" OMI, rather this is one of the few patients who has something other than thrombus causing the OMI. The only appropriate way to differentiate occlusive spasm from occlusive thrombus is by performing an emergent angiogram. See our other cases of spasm here. 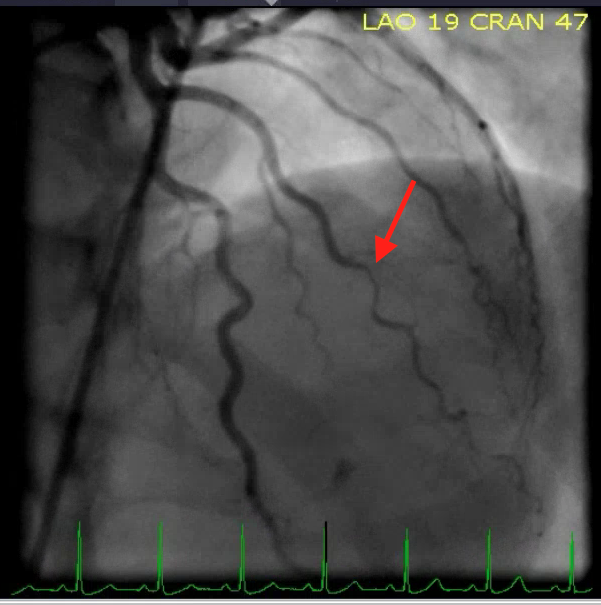 This patient never met the "STEMI criteria", like many other very significant acute coronary occlusions and near occlusions. Young people can have acute MI. Don't forget to look for the signs of OMI within PVCs. I believe that even transient OMI/STEMI should ideally be taken to the cath lab if feasible, because it is unlikely that the patient will get serial ECGs and close monitoring enough to recognize reocclusion before more myocardium is lost, or worse, even in the best of hands. Thanks for this comment and your expertise. We are obviously ED physicians, not angiographers, so we would not be able to comment on that. I have presented here the findings in the patient's angiogram report. I will continue to follow up on the patient as possible and hopefully be able to figure this out. From the ECG educational point of view of this post, this further supports our teaching point that the ECG cannot differentiate the etiologies of acute coronary occlusion. Great case and discussion by Dr. Smith! Leads I and aVL are said to visualize the “high lateral” wall of the LV. On rare occasions, lead aVL (which is the “higher” high lateral wall lead, looking down at the heart from the left shoulder) may be the only lead showing ST elevation. 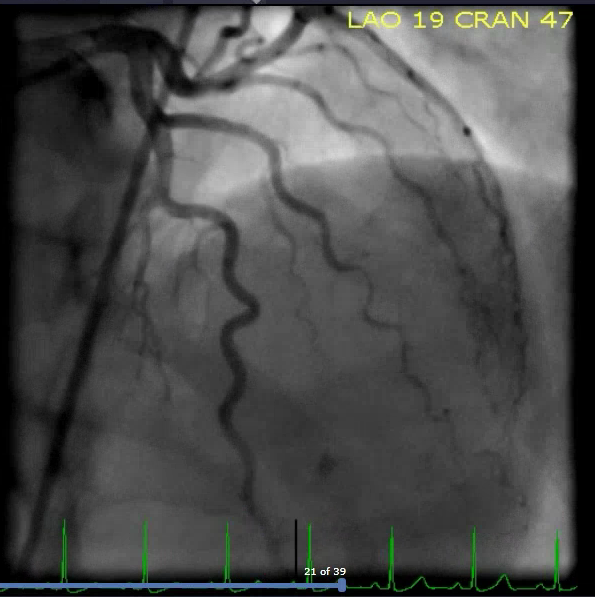 This can be problematic, since some degree of ST elevation might be seen normally. That the case here is not a normal variant, was evident from the mirror-image reciprocal ST-T wave picture in lead III, with ST-T wave flattening also seen in the other inferior leads (II, aVF). “Icing on the cake” was Dr. Smith’s astute point about undeniable inappropriate ST elevation in lead aVL for the PVC. The rest of the initial ECG was unremarkable. It is well to remember that on occasion, lead aVL may be the ONLY lead to manifest ST elevation. Suspect a problem in the 1st Diagonal when the history indicates new symptoms, and inferior leads suggest subtle-but-real reciprocal change. THANKS again to Dr. Smith for presenting this highly insightful case! Given the history and the clinical situation, I would have been concerning of aortic dissection.